The Atomic 4 in my A30 is still ticking, but I often ponder how I might re-power the day it stops. I'm intrigued with electric conversion, and sometimes search the Web for examples of sailboat skippers who have done this. It is amazing how many have, and how many kits there are that (purportedly) make this conversion relatively easy. This article will summarize what I have learned and offer links to where you might learn more. First of all, no sign of an A30 having tried electric conversion yet, although there were some noises made a couple of years ago on the Alberg 30 site in archived messages. (Use the Google search feature in the lower right of the page and type in "electric power" to pick up the thread.) Examples abound of other full keel conversions, however, such as a few Alberg 35s. And there are numerous fin keel conversions. In most cases, the engine they are replacing is an Atomic 4. The electric motor they are replacing it with is usually of the pancake design - low voltage/high torque permanent magnet motors first pioneered by British inventor Cedric Lynch in the 1980s. Several manufacturers have since licensed this technology. One of these is Electric Yacht. For about $3000 you can have a drop-in replacement for the A4 - motor/controller assembly, electronic battery monitor, throttle and master power switch. Add a 200 AH battery bank and 48v charger and the bill should run around $6000. This buys a 48-volt system that should get an A30 up to hull speed when you need to and provide a 20-mile range at perhaps 3-4 knots. SolidNav has a similar offering. One note of caution: both of these US companies seem very young with few actual installations. The one SolidNav installation I could find was their project boat - a Catalina 27. Here is a good description of the installation, including removal of the A4 - http://www.electric-sailboat.com/Our_Project.html. A European manufacturer seems a little more established and a lot more expensive. 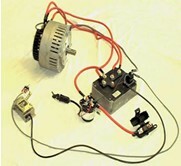 ASMO Marine of Copenhagen has been making marine electric propulsion systems for 10 years - http://www.asmomarine.com. The setup is similar to the US manufacturers, but the company offers a broader range capable of powering yachts up to 50 feet long and replacing diesels of 60 hp. The ASMO site has six conversion case studies. Considering that these yachts do their sailing in the North Sea, they lend credence to the possibilities. The US distributor is NGC Marine of Wisconsin. Pricing starts at around $6500 for the basic system sans batteries, charger, etc. All the above systems are similar in that they come ready to install by anyone reasonably handy with a wrench. They are mounted on adjustable rails that easily align with the existing mounts and your prop shaft. The fact that the whole assembly weighs less than 50 lbs. also helps. Your boat doesn't even have to come out of the water. The more difficult exercise will be customizing your boat's interior to securely accommodate 500 lbs. of batteries. An alternative is the less expensive, more do-it-yourself systems - what building Heathkit radio sets must have been like. You get the components and do your own mounting and assembly. Thunderstruck Motors offers the Mars Brushless Sailboat Kit, which will supposedly power boats of up to 30 feet in length and 12,000 lbs. displacement - http://www.thunderstruck-ev.com/sailboatkit.htm. Prices start at $1150. One boat taking this route was "Redeemed", an electrically converted Columbia 30 you can read more about at http://www.redeemedcc.com/index.html. It has similar dimensions to the A30, but even heavier displacement at 11,740lbs. The owner extracted the Gray Marine - another gas engine familiar to A30 owners - and installed a DIY kit. This very handy owner made his own mounting templates for the motor and the belt-driven 50% reduction gear that brings shaft RPMs down to usable levels. He even crafted a Kort nozzle (a shroud around the prop, found on all tug boats) to increase thrust. For additional information on electric propulsion in general, try these two sources. Surprisingly, one is YouTube. Type "electric sailboat" in the search field and you'll see tons of videos of people documenting their conversions. Another is a Yahoo Group entitled "electricboat". You have to join and, while you're there you may wish to join the "Alberg22" group as well - http://groups.yahoo.com. Weight? A wash. Factory weight of the A4 with direct drive is 310 lbs, plus another 100 lbs for the 10-gallon tank full of gas, and maybe another 100 lbs of house batteries. Total about 500 lbs. Weight distribution. Clearly a plus, depending on where you locate the batteries. In my liner model, I would sacrifice the holding tank under the salon sole (I recently converted to a composing toilet) and extend the existing battery compartment. You are basically taking 500 lbs. of weight heavily concentrated aft and redistributing it over the keel at a much lower point. This should take the traditional squat out of the stern and literally add some lead to the keel. Fuel savings? Maybe. It's true you will have zero gas expenditures but don't forget you will also consume batteries - probably a complete set every 5 years or so. Depending on the size and quality of the battery bank, this can run from $1200 to $2500. That pays for a lot of gas. Power? The direct drive A4 - while rated 30 hp - produces this at about triple the RPM that the prop can effectively use without cavitating. So we really only have about 10 hp at our disposal. The electric conversions we've been discussing here are rated around 6 hp. However, they produce this power at any rpm. This is why they are described as replacements for diesels up to 20 hp and can drive an A30 to hull speed. That said, I'm sure most gas and diesel engines have better reserve capacity for fighting a heavy chop and stiff headwinds. Range? Certainly the A4 rules here. Mine will easily cruise a hundred miles on its 10-gallon tank, and a couple of gerry cans will double that. With electric, you'll be planning your route the entire way and watching the battery reserve. But that's also part of the fun and challenge of sailing and a reason why we're not power boaters. But electric also has some unique range-extending possibilities, such as regeneration. With the right controller you can harness the energy of your dragging, spinning prop under sail and charge your batteries. The ASMO site estimates that "recharging for 1/2 hour at 5-6 knots normally equals the power used for harbour manoeuvring". This sounds too optimistic to me, and you do need to be tearing along at 5+ knots before regeneration even begins. Other estimates I have seen are at least 4 hours charging at 5+ knots to provide the juice for 1 hour cruising at maybe 3 knots. A three-blade prop will likely be more efficient for charging than the original 2 blade. You can also recharge with a 48-volt wind turbine like the Air-X Marine; and solar is another option. But both of these are better at keeping batteries topped up as opposed to rapid replenishment. For this, you need shore power and a good charger. If you really do need to cruise non-stop from one end of Lake Ontario to the other, you can connect a small portable generator like the Honda 2000 to your charger. This kind of defeats the purpose, I suppose, but at least the Honda is quieter than the A4 and multipurpose. Use it as a backup at home when you don't want it cluttering your boat. Maintenance? With one moving part - the armature - there's not much to do. No oil changes in engine or gearbox (because there's no gearbox). No fuel or oil filters. No mechanical connections or cables. The only maintenance required is to change the gearing belt after 8,000 running hours and the engine brushes after about 6,000 running hours (unless the motor is brushless, as some of them are). Most owners can complete both tasks in a half hour. If you use flooded batteries rather than the pricier Gel or AGM batteries, most of your maintenance will be here. The sheer number, weight and limited capacity of these batteries are the biggest negative of electric propulsion, in my view. But a silver lining may be that battery technology is rapidly improving, and your first replacement set five years down the road may be huge improvements in performance. Am I a convert? Not yet, but I also don't see a big future for my A4. I like the idea of electric propulsion as something that's more compatible with the sailing experience - quiet and environmentally friendly. It may even make a better sailor out of me if I have to think a little before automatically firing up the iron genny just because I might be late for dinner. After all, people have circumnavigated an Alberg 30 and similar craft with no engine at all. Shouldn't I be able to venture out on the Great Lakes knowing there are limits to my motoring? Randall Litchfield lives in Guelph ON and sails Impromptu - A30 hull #592 - out of Burlington.